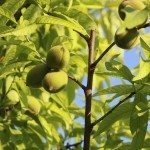 I have a peach tree that has curly leaves and it releases a sticky liquid that when it dries become harder. It doesn't look healthy at all, and I heard about applying copper to treat it. Is that true? Is it organic? What can I do? I want to keep my trees and garden chemical free. Please help. Thank you. Your trees have a disease called peach leaf curl. It is a fungus and, yes, copper fungicides will treat it. I also suspect that it may have peach borers. Pests are often attracted to plants that are already sick, so this would make sense. Most copper fungicides are considered organic and are effective against peach curl when regularly applied, but, because I suspect a pest problem as well, I would recommend a spray called neem oil. It is organic, safe for people and pets and is both a pesticide and a fungicide. It will treat both the peach curl and the peach borers.